Can you believe that I've really wanted to post several times in the last few weeks? but Travis took my camera cord away- and I was incapable of posting on the blog without it. So let's blame him for my absence from the interwebs. You guys. I didn't realize how much I depended on Grey and Micah taking naps. The gave naps up for good about a year and a half ago, and my blog has seriously gone down hill since then. I didn't realize that I needed naps- because I didn't always blog during naps or anything. But I suddenly had two hours less me-time than I was used to and apparently, it messed up my whole game. I don't think it was the three-kids thing. I think it was the two-unnapped-kids thing. Except that my baby is almost two, so did I start getting crappy at blogging two whole years ago? Sorry. For those of you still around- thanks guys. Sorry I'm the worst at posting. But despite the fact that almost-five year-olds don't take naps- they are amazing and fun. 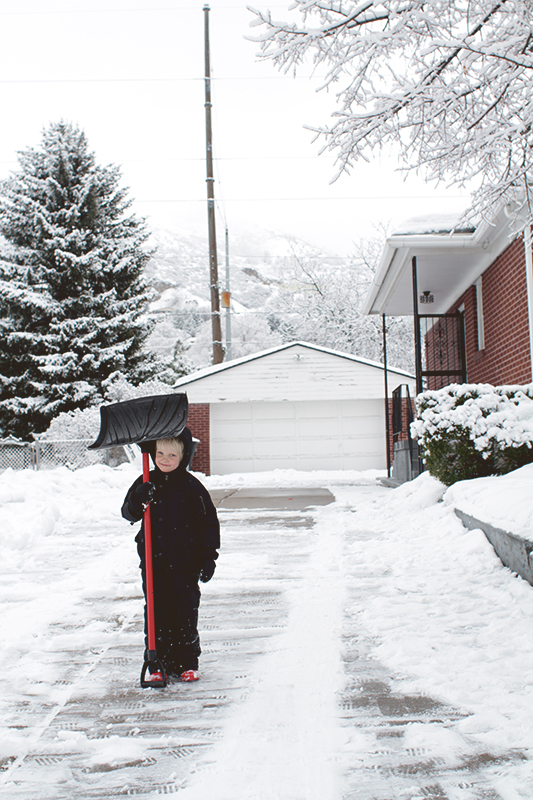 The other day, after a snowfall, Grey and Micah asked to get on their snow clothes and go out. 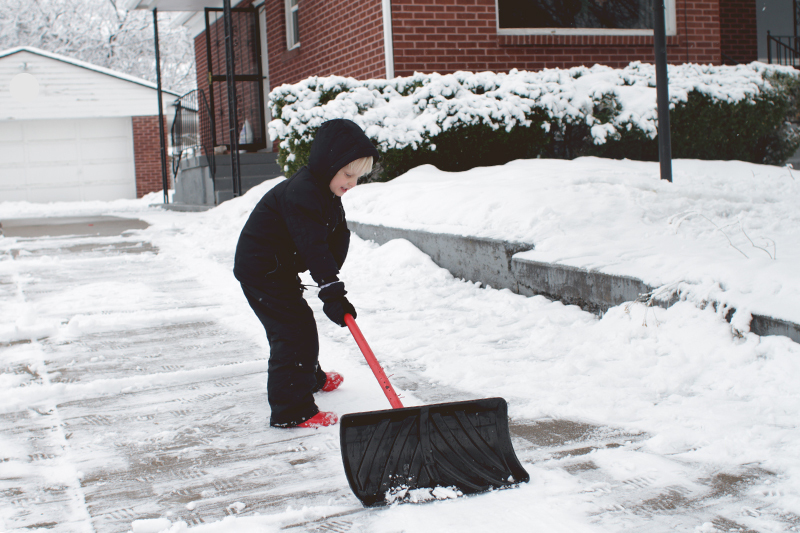 "Grab a shovel and clear the driveway!" I called out to them, as they tumbled out and away. Then I closed the door on the cold air and hung out with my baby for a while. Throughout the next hour, I could occasionally hear them shouting and laughing and I saw them roll or plow through the front yard a few times. But I was not anticipating that my driveway would actually be shoveled. BUT IT WAS. Sure it was only 2-3 inches, but that was 2-3 inches that I was going to let half-melt and turn into ice. Grey had done it by himself, and when I came out and said in delight "Let me take a picture of you standing in our cleared driveway!" he said, "Fine, but make it fast. Should I pose like this, with the shovel?" It's funny to see differences in Grey and Micah that I didn't expect. I often ask them to do chores together, and they'll say "I can do this one by myself," or "my brother can do this one alone." There's rarely any argument. They just know who likes what kind of work. 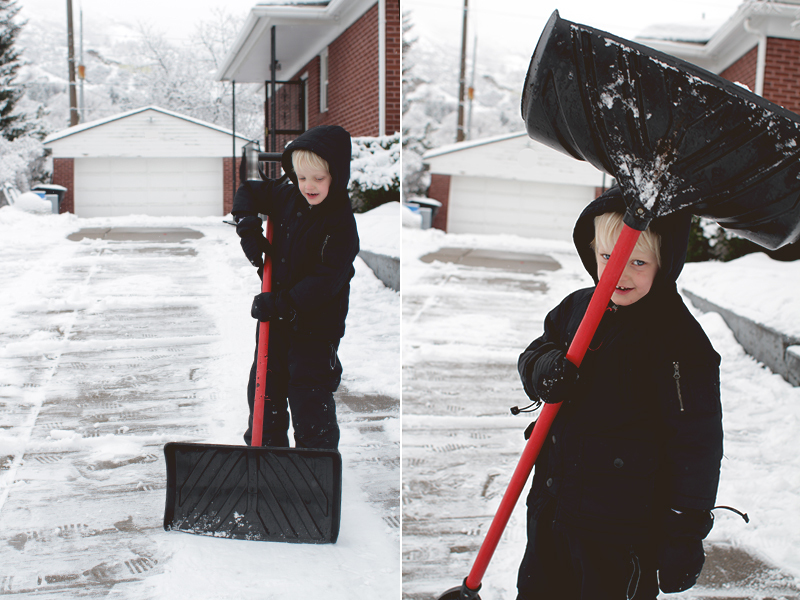 Grey likes shoveling, Micah likes unloading the dishwasher- and everybody likes mopping and cleaning the toilet! (Everybody except me, of course.) Yay for almost-five! I love seeing them working! It will give them so much confidence in themselves as they grow. Plus they are cute workers!